The Russian minister of defense Sergey Shoygu left for Turkey on February 11 for a working visit to discuss issues relating to Syria. Shoygu’s visit is interesting in the context of his meeting with the Armenian minister of defense Davit Tonoyan in Moscow ahead of his visit to Turkey. Tonoyan had a full visit to Russia where he met with the minister of defense Shoygu, the commander of the Southern district, defense industry leaders. Alongside this visit it was reported that the Armenian humanitarian mission including a mine clearance team and doctors has left for Aleppo. Shoygu thanked Tonoyan because Armenia was the first to respond to the call for humanitarian assistance. The discussions with the Russian side started during the former government. In 2017 the minister of defense Vigen Sargsyan stated about these discussions. 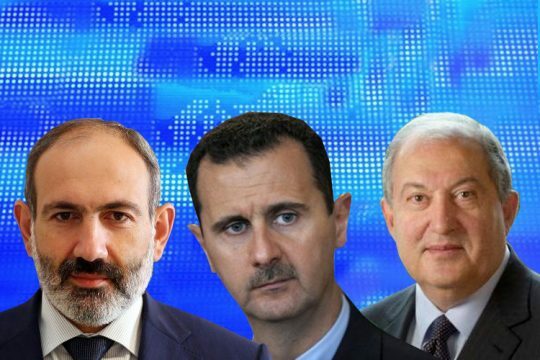 The Armenian mission is in Syria on the decision of the new Armenian government and in a new situation. This situation changes regularly, rather fast. The Armenian mission in Syria is a humanitarian mission but its role is political. The Armenian state is participating in the defense of the Armenian presence and factor in the Near East, and this factor has a key role and importance in the depth of the geopolitical hotspot in the Near East. In this respect, the Armenian factor in the Near East cannot be deleted because otherwise the geopolitical system will collapse. It is almost beyond doubt that during the visit to Turkey the Russian minister of defense will touch upon the issue of the Armenian mission in Syria or rather Ankara will touch upon this issue and Moscow was preparing for it by receiving Davit Tonoyan’s working visit, including some statements made during it, namely the supply of modern high precision weapons to Armenia which will endure the preventive dominance of the Armenian side. The overlap of the start of the Armenian humanitarian mission in Syria with the Moscow visit of the Armenian minister of defense is not a coincidence, and its purpose was to demonstrate the connection between the humanitarian mission in Aleppo and policy and security issues in the Caucasus from the point of view of Armenia being a subject. Armenia helped Shoygu to leave for Turkey during the three party Russia-Iran-Turkey meeting in Sochi on February 14. Yerevan left Turkey alone in this format against Moscow and Tehran, with the start of the Syrian mission. What statements will be made during Nikol Pashinyan’s visit to Iran at the end of February.